The Pars stumbled to another depressing defeat and despite some good spells of play their inability to take the chances they do create is crucifying the team. Scott Morrison v Saulus Mikoliunas. This was always going to be a tough encounter against a physically strong Hearts side yet the Pars did reasonably well containing the Edinburgh side for most of the game which was a fairly poor spectacle, whichever side you were watching. There were a few changes in the Pars line up with Roddy McKenzie replacing the injured De Vries in goals. Jim Hamilton returned from suspension and Scott Morrison started with Dacquin and Muirhead also out injured. The Pars lined up with McKenzie in goals, Shields, McGuire, Wilson and Young the back four. Mason was on the right midfield with Bamba and Simmons in the centre and Morrison on the left. 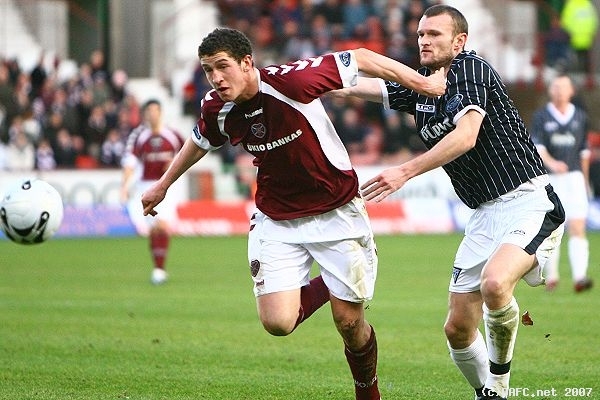 Crawford and Burchill were the strikers. Mark Burchill v Christopher Berra. Bamba again started looking lively with an early shot in 5 minutes that went wide. He did even better a couple of minutes later forcing Gordon into a good save low to his right pushing the shot around the post. Darren Young picked up a yellow card for a late challenge in only 12 minutes so was again walking the "sending off tightrope" for the rest of the game. The Pars created another good chance in 13 minutes as Shields put over a low cross that Crawford missed. 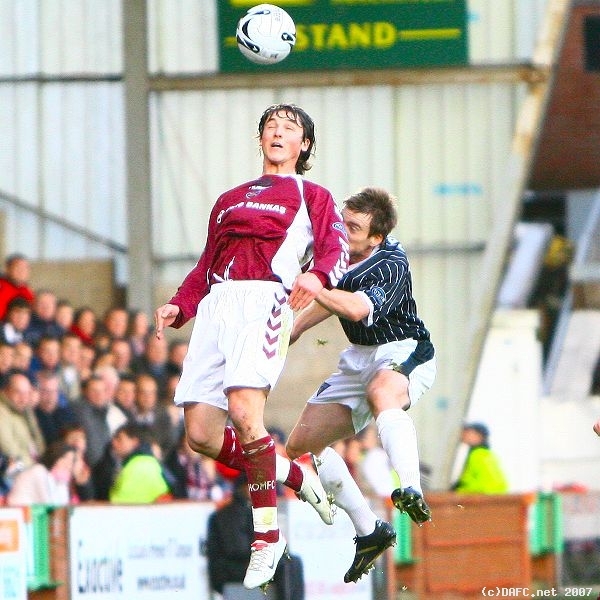 At the other end Hearts were not having much joy and indeed it took Phil McGuire to slice at a clearance to give McKenzie his first scare as the ball went out for a corner. From the corner Pospisil stabbed the ball home through a crowded six yard area to give the visitors an undeserved lead. Even the muted reaction from the large visiting support suggested they were also taken by surprise by the goal. That was a real set back for the Pars and the heads seemed to drop. The Pars were struggling to hold the ball or to make sensible passes with noone taking responsibility to hold the ball and Bamba spraying passes everywhere other than to a team mate. There was some good work in 27 minutes on the Pars left with Morrison and Young involved resulting in Young shooting over the bar from a good position. Hearts made an early change with Fyssas coming on for Wallace after 31 minutes. In 34 minutes a typical Pars scenario with a good move on the right leaving Mason running towards the 18 yard line in a good position to shoot or take the ball forward but he chooses to pass sideways to Crawford and the danger passed. There was a bizarre moment in 41 minutes as Hartley appeared well offside to the point he almost stopped himself then realised the linesman was waving play through on McKenzie, it seemed a certain goal, but the big keeper made a great save. Hartley was probably put off by the stop start nature of the move but it was a great save by Roddy. Just on half time McKenzie made another great save tipping a header over the bar keeping his team in the match. Half time 0-1.
ball and misses - with costly consequences. 1-0 down. The Pars made two changes at halftime with skipper Greg Shields and Gary Mason going off with Hamilton and Owen Morrison coming on. Shields was very poor in the first half and seems to have lost all his "zest" for the game perhaps ilness is to blame. Mason had also picked up an injury. Darren Young was switched to right back with Scott Morrison dropping back to left back. 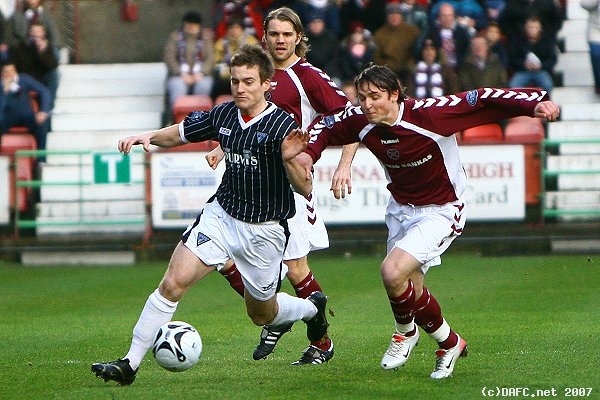 Hamilton actually made the Pars much more effective going forward with his physical presence despite the close attention of the Hearts centre backs. Scott Wilson has been a major figure for the Pars despite the odd lapse in concentration but he was at his best in 47 minutes as he made a terrific tackle in his own 18 yard box to clear for a corner. Hartley was always looking for the half chance running in late from midfield and half hit a shot in 52 minutes that McKenzie easily saved. 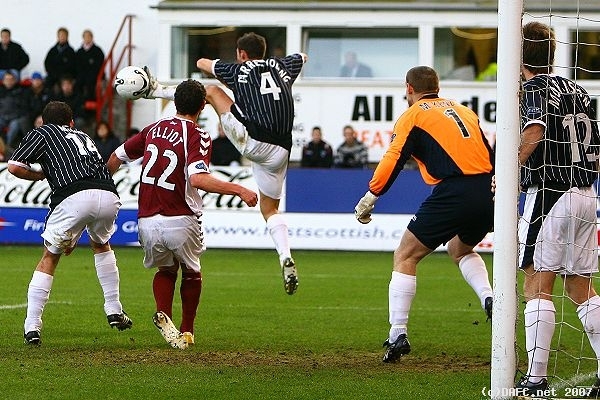 Elliot had a good chance for Hearts in 53 minutes but his header was well over. The Pars had a good spell in the next 10 minutes which got the home support turning up the volume. Crawford had a good shot well saved by Gordon and then another great chance saw the ball run across the face of the Hearts goal with no takers. You just sense at the moment that one goal could be all that it takes to turn things around for the Pars but despite the chances being made the ball is not falling for the Pars just now. 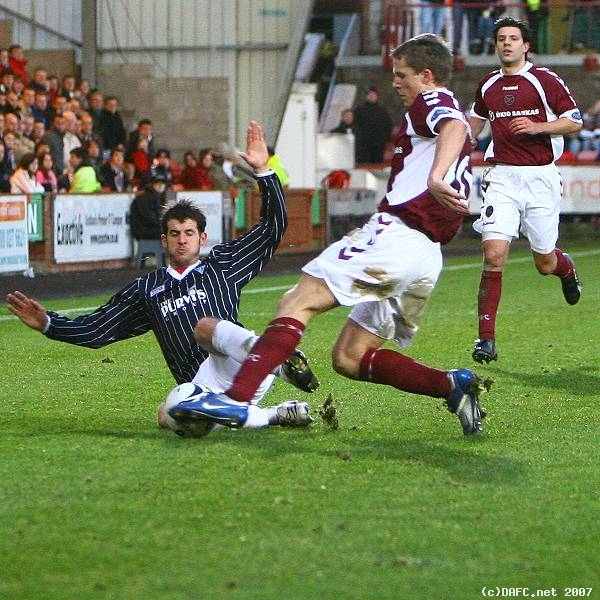 Another feature of a disappointing game were the Hearts time wasting tactics which must have been just as disappointing for the visiting fans who were wanting to see their team attack, which they were not really doing to any effect. Stevie Crawford yellow card (1 of 3). Crawford was booked for a challenge, which from distance seemed to be a 50:50 type position and he also came off worst with an injury. Hearts made a further change with Mikoliunas coming off and Barasa going on. This was followed by the Pars taking off Bamba who had again fallen out of the match with Greg Ross coming on. Stephen Simmons had a shot saved in 73 minutes but by this stage it was all very "bitty" although Owen Morrison was being a bit more effective than seen in recent weeks giving Neilson an hard time as he had done at Tynecastle.